Antivirus 10 is a surprise to us all. In the past, rogue antivirus tools were extremely popular, and tons of new fake AVs would emerge every single day. Nowadays, cyber criminals usually employ ransomware, Trojans, and other dangerous threats to attack operating systems and bring computer users to their knees. The last rogues we have reviewed on this site were Antivirus Pro 2017 in May 2015 and Defender Pro 2015 in March 2015. The emergence of the new rogue antivirus is surprising and also unnerving. Does this mean that more rogues will be following suit? Probably not, but we will keep our eyes wide open in case more fake AVs come into play. Right now, let’s discuss the removal of Antivirus 10. The good news is that this rogue is not extremely complicated. In fact, anyone can delete it, and you do not even need previous experience with rogues or any other kind of malware. The instructions below will help you get rid of the threat, but you should read the report first to learn more about it. The malicious Antivirus 10 is launched from an executable file that might have been downloaded onto your operating system without your permission or that you might have downloaded yourself by accident. If we are talking about the first scenario, you have to be cautious of other threats that might be active. 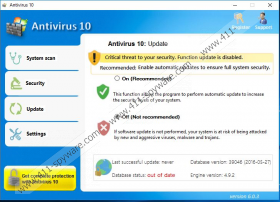 Obviously, you should not pay any attention to the infections detected by the bogus Antivirus 10 scanner. These threats are not active on your PC. Nonetheless, real threats might be present, and we suggest installing a legitimate malware scanner as soon as you remove the rogue to figure out which other threats you might have to obliterate. Now, if you have downloaded the rogue yourself, you might have done that after being scammed with the help of a fake online scanner or a bogus pop-up introduced to you by malicious adware. In any case, scanning your operating system is very important because you might discover other, even more aggressive threats that must be deleted. Once Antivirus 10 is executed, it adds a run key called “SecuritySoft,” which allows the rogue to run upon startup every time. Also, the infection sets itself as the default Windows antivirus, which makes Windows Advanced Security Center to introduce you to a bogus security warning. 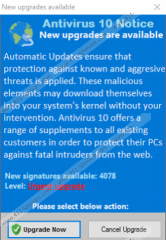 This warning is meant to convince you that you need to activate Antivirus 10, and that, of course, is not something you should do. Unfortunately, many victims follow the recommendation because they are truly intimidated by Trojan.Ransomcrypt.AP, Adware.LoveFreeGames, Trojan:Win32/FakeSysdef, and other bogus infections that the fake scanner urges them to delete. To push its victims over the edge, the rogue also bombards them with bogus pop-ups suggesting that their virtual security is at risk. Here are a few fake warnings that the rogue might introduce you to. Remember that these are completely bogus. Microsoft Windows has detected infection of Backdoor.Duuzer.B in your system! This backdoor is remotely controlled by an attacker whos aim is to get passwords and credit card details from infected computer. It is highly recommended to remove this infection as soon as possible to prevent identity theft. Trojan.RemoteSpy is suspected to have infected your PC. This type of virus collects users data and sends it to remote attacker server. Besides flooding you with fictitious security warnings, Antivirus 10 is also capable of launching Internet Explorer and showing you pornographic content along with bogus but intimidating “virus found” warnings. If you start to panic without realizing that you are being scammed, you might choose to follow the “recommendation” and activate the full version of the rogue. You could dot that via any of the fake alerts or via the interface of the fake scanner that has the “Get complete protection with Antivirus 10” button on the bottom left corner. Luckily, the purchase page does not work right now. If it starts working by the time you are reading this, whatever you do, DO NOT pay any money, even if it is just $1. As you already know, deleting Antivirus 10 is easy. According to our tests, it is enough to terminate the malicious process, remove the .exe file, and get rid of the RUN key. If you perform these three tasks successfully, the fake notifications will stop, and you will be able to focus on the remaining threats. The most problematic task might be detecting the .exe file. If you are unable to do that, we encourage you to install a legitimate anti-malware tool that will automatically find and delete all malicious components, along with all third-party threats. More important, this tool will keep your system protected ensuring that other rogues cannot slither in in the future. We advise employing legitimate anti-malware software even if you successfully remove Antivirus 10 manually. Launch Task Manager by tapping Ctrl+Shift+Esc keys. Identify the malicious process (it could be named AV10PRT.exe) and right-click it. Select Properties and move to the General tab. Copy the location of the malicious file and then click Cancel. Click the malicious process and then click End Task/Process. Place the cursor into the bar at the top and paste the location of the malicious file. Find the RUN registry (under HKLM\Software\Microsoft\Windows\CurrentVersion\Run or HKCU\Software\Microsoft\Windows\CurrentVersion\Run). Right-click and Delete the value named SecuritySoft. Install a legitimate malware scanner to inspect your operating system and check for potential leftovers.